Overview - What is Emacs? a slick LaTeX editor which allows (relatively) simple LaTeX editing and previewing. an environment for editing LISP code, something which allows folks to write their own extenstions to Emacs. Major modes customize the methods of editing particular types of files. So... the LaTeX mode 'knows' how to work well with LaTeX files, the S mode 'knows' how to work with S files. This allows keywords and special constructs within each mode to be drawn differently, typically in different colors. Examples of this would be begin and end codes within LaTeX, or the color of quoted strings in C++. The feedback from such highlighting prevents many common typos. This typically allows proper indentation within blocks of code, such as within if-then-else constructs. This also prevents the common typo of forgetting to end blocks. Sub-shells allow running applications from within Emacs while using Emacs' major modes to speed the editing of commands. The primary examples of this here are running S (or R) and Matlab from within Emacs. Sure, there are other editors which can accomplish these tasks for particular languages or applications. The classification of Emacs goes from cool to kewl, though, because it provides a single interface with a single (albeit strange) set of keyboard shortcuts and mouse clicks to learn. It is also extensible. When I used to program Stata very heavily, I yearned for an editor which would format and highlight for me... so I wrote a mode to handle Stata coding. 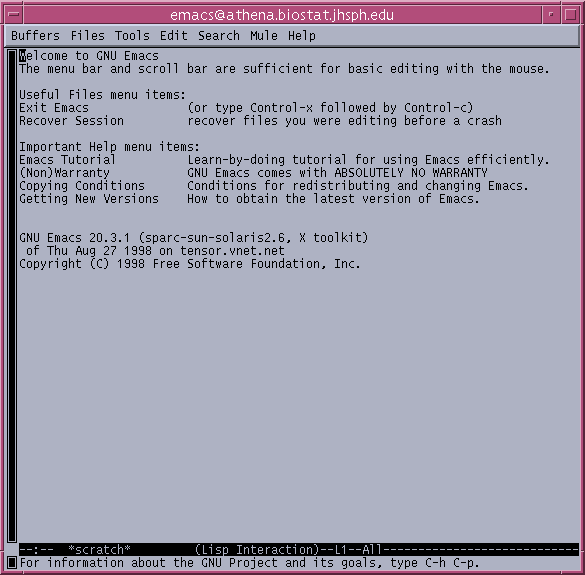 Emacs runs on pretty much any flavor of Unix (including GNU/Linux and Mac OS X), on the classic Mac OS, and on pretty much all types of MS Windows which still get used. Here are locations for getting Emacs for yourself, regardless of what OS you like. Note to folks using R at Hopkins: To use the subprocesses, such as R, you will need to use Emacs on the biostat server itself. Enquiring minds might be asking about command line flags or other such unix 'fun'. Be patient - this is dealt with later. Take the advice given on the screen and run through the tutorial. As it sez on the screen - the tutorial can be found under the help menu. There are many references to this thing called a Meta key. If you are using one of the Suns, the Meta keys are the keys with the diamond (on either side of the spacebar). If you're hooking up with an MS Windows machine, use the Alt key. If you're using a Mac, it is the option key. There are many references to the Control Key. This is labelled as Control on the Suns and Macs, but as Ctrl on Wintel keyboards. Come back to this page when you're finished. It'll take, oh, about a half hour. Don't even think of skipping the tutorial! As you can see, Emacs could very well be an acronym for Excessive Meta and Control Sequences. Don't get too worried. The strength of emacs is its ability to quickly edit without forever grabbing the mouse. Note:The page up, page down, and arrow keys function as expected for moving around. They are generally easier to use than the Emacs scrollbar, especially if you don't have a three-button mouse. brings up the Info window for learning everything but everything about Emacs. If you do not know how to use Info, take the advice at the top of the screen, and type an h. This will take you on a guided tour of Info. Note: This, too, is worth the time, since Info is an indispensible tool for finding out not only how to use Emacs in particular, but also how to run S from within Emacs, or use Emacs for LaTeX. Correctly installed packages will have their help integrated into Emacs' Info, so learning to use Info is critical. If you do know how to use Info, you can use the usual search, C-s to search for what you want to know. opens up a second window which shows you all the key bindings (a.k.a. keyboard shortcuts) for the buffer in which you are so diligently working. This is the quickest way to see if there is some good mode-specific binding which could save a bunch of effor. takes you to the mini-buffer, so that you can type in a function that you remember, such as undo, and get the key sequence to which the function is bound. asks you to type a key (like, say C-/). Emacs will open up a second window with an explanation of the function used by the key. This help is invaluable if a key does not seem to be behaving properly (often a key's purpose will be changed depending on the mode). takes you to the mini-buffer, so that you can find out what a particular function does. OK, OK, maybe this is not as helpful to you as it is to me. I guess I've gotten lost in the tweaking of Emacs. The context sensitive highlighting will help guide you through all the fun mark-up tags which make up LaTeX. There will be a menubar item called LaTeX, which allows menu-driven insertion of various commonly used LaTeX tags into a buffer. These can also be accessed via the mode-specific C-c key sequences. There will be a menubar item called Command which allows running the file through LaTeX to typeset it, running it through xdvi to preview it, and then running it off to the printer. This picture was taken with customized settings, since the default colors are pitiful for my desktop setup in that awful CDE. KDE or Gnome, here I come! Emacs will also correctly recognize the file extension .bib for BibTeX files. What are BibTeX files? BibTeX is the automatic bibliography generator for LaTeX, and is invaluable when writing papers. If you wanna typeset mathematically interesting things, you need to learn to use LaTeX. If you're going to use LaTeX on the Unix server, you should learn Emacs - it'll save immense amounts of time. Emacs will divine your overwhelming urge to work in R whenever you open any file which has an extension of .s, .S, or .q. It will figure that you are wanting R if a file has an extension of .R. If you wish to start working in S (or R) without having a specific file that you want to edit, simply typing M-x S will start S, and M-x R will start R. Both of these modes allow you to work in S (or R) with the usual context-sensitive highlighting. By now, you will have guessed that Emacs will detect SAS files (program files, that is), and will help you edit them with nice context-sensitive highlighting. I'm working on getting ESS (Emacs Speaks Statistics) to correctly run SAS from within Emacs, but at this point (Friday, July 28, 2000), it is not quite functional yet. Don't expect too much from the SAS mode as yet. Emacs will even understand the need to work on Stata programs if you open any file which has an extension of .ado, .lbl, or .do. The Stata mode is not as slick as those above, since it is merely a device to edit Stata files. It is not integrated into a networked version of Stata. (Possibly because we don't have a networked version of Stata.) Still - it is useful for editing Stata programs. This is done via C-Mouse Button 2 (control-middle-button). The keyboard is simpler: C-w (for wipe). The right button will copy once you've made a selection. If, on the other hand, you want to use the true Emacs way, you could just select the text, and then hit M-w. The middle mouse button will paste (known in Emacs parlance as yank). The keyboard short cut is C-y. Emacs keeps a very large kill ring, and successive C-ys will pull out earlier kills. You can also go to the Edit menu to see what is on the kill ring. I will probably lose my membership in the True Emacs Lovers Club, since I have even mentioned that a mouse can be used. I personally use the mouse very little, because I find remembering bindings to 3 mouse buttons harder than remembering keyboard shortcuts. The defaults are really hideous. The default set-up negates the value of the context-sensitive highlighting by having a bad choice of colors. Color-blindness can wreak havoc on color coding. C'mon, now! Tweaking is the prime reason for Computers! This is the easiest way to start customizing! One of the wonderful things about Unix is the simplicity with which you can use others' outrageously complex code as though it were your own. To get other folks' customizations for free, just go to their home directories, and copy their .emacs file. There could be some things which don't quite work, but hey, you can't have lost anything! Emacs would not be called an extensible editor if it did not have some mechanism for customizations. For most folks, the customizations can be rather intimidating, since everything in Emacs is written in a variant of LISP, known as Elisp. Lisp is wonderful if you understand it, but Lots of Irritating Single Parentheses if you don't. As you (might) know, Unix commands typically have a series of flags which can be set by the user to cause a command to run differently than its default. Here are some of some of the ones I find useful. Note: the first of these - the one which changes the color of the Emacs window is very useful. The bg flag will change the background color of the Emacs window. The fg flag will change the foreground color of the Emacs window. Hmm... I bet there is a way to do this in Unix, also. The font flag sets, uh, the default font for the pretty text characters. The geometry flag sets the size of a default Emacs window. Makes the background a nice light yellow like eye-saver paper. Makes the foreground (the actual type) black. Uses the real Emacs icon when Emacs is minimized. Uses a fixed-width font which I find very readable. Starts with a window which is 90 characters by 36 lines. Allows filenames to be passed through the alias to Emacs, so that typing niceemacs foo.tex would start up Emacs editing the file foo.tex. Runs as a separate window, leaving the terminal window free for more work. Now, wasn't that fun? (You can copy this and paste it to the bottom of your .cshrc file, if you like). Emacs, just like other unix applications has initialization files. When Emacs starts, it first races off to see if there is a site-wide (for us: department-wide) start file from which it should pick up customizations. There is such a file, of course, so that each individual user don't have to waste time getting LaTeX to run when (s)he wants it to. After Emacs has run through the site-wide initialization file, it looks for a .emacs file in the user's home directory. This, also, is typical behavior for a Unix application. Any other tweaking you'd like to do, you can put in this file. The most common customization that people need is that of the color of the window, and the color of the fonts in the context-sensitive highlighting. The order in which the customizations are made is important! Get a background color you like, and then get font colors. Customizations can be done on the fly from within Emacs by typing M-x customize. A menu with various groups will be presented, and changes can be made by clicking on options(!) using the middle mouse button in Unix (or its equivalent when using an X-server to hook up to Athena). If this seems complex, try the command M-x customize-apropos, and then entering an appropriate word. Emacs will then bring up a customize buffer containing those items in the customize window containing the word. There are menu items for many of the common actions. There are handy shortcut sheets in the computer labs which you can use until you can type C-x C-c with the best of them. If you're not in the computer lab, but need access to a reference sheet, go here to get PDF or Postscript files for version 20, or go here to find something for the browser (which is for version 19). If you get desparate, and want some words of wisdom from Zippy the Pinhead, try typing M-x yow It will make you feel better. If you get really really desparate, and think you need a shrink, try typing in M-x doctor.